This porridge is so crunchy and delicious that you will want to have another bowl right after you had the first one. It’s naturally gluten free and packed with antioxidants and fats that come from raw cacao and coconut. It takes a little bit longer to cook, but trust me it will be worth every second of your time. Coconut milk makes this millet porridge nicely creamy and adds a little bit sweetness too. 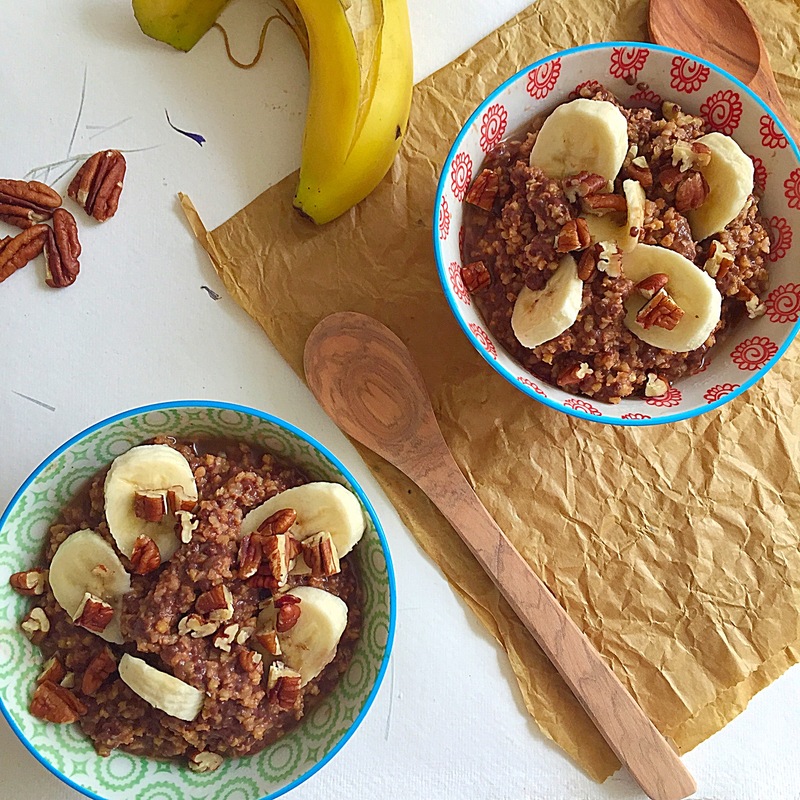 I like to top it with bananas and pecan nuts as they go really well together, however you don’t have to stick to these toppings, you can add any of your favourite toppings to the porridge! I think blueberries and coconut yoghurt would work together as well. Mix together 5 tbsp of water and raw cacao until smooth. Add the remaining liquid and transform into a saucepan, place the lid on the pan and bring it to boil, add a tiny pitch of salt and coconut sugar. Mix well until the sugar is completely dissolved. Transfer the pre-washed millet to the water and stir it well. Bring the mixture to a boil, stirring constantly. Decrease the heat to low and simmer until the grains absorb most of the water, about 15 minutes. Remove from the heat and let stand. Like most grains, millet needs a little time off the heat to fully absorb the liquid. Allow the porridge to sit, covered and removed from the heat, for 10 minutes. 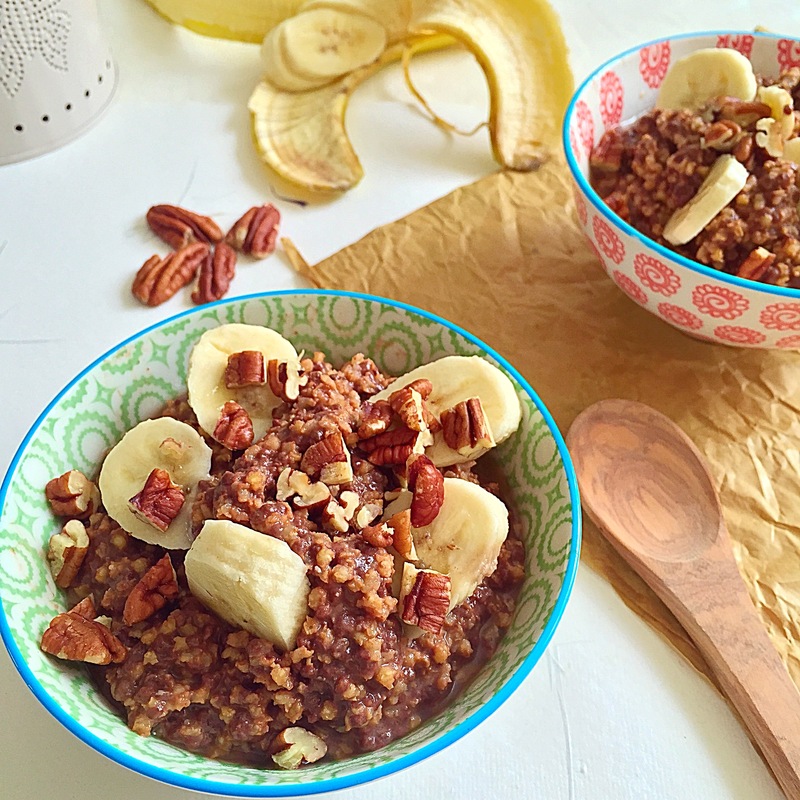 Millet does not keep well and is best served warm, so transfer the porridge to a breakfast bowl, top it up with sliced banana, chopped pecan nuts and eat immediately.